St Andrew’s House at St Margaret’s RC Primary School has blue coloured tee shirts to represent the colours from the Scottish Saltire flag. Watch a clip showing the story of St Andrew by clicking HERE. A long, long time ago in Galilee a fisherman called Andrew spent his days fishing. One day he heard a man call out from the bank. “Follow me” the voice called. That man was Jesus of Nazareth and Andrew immediately lay down his nets and became one of the twelve disciples. Andrew watched Jesus perform many miracles. It was Andrew who first spoke to the boy who offered to share his five loaves and two fishes with Jesus at the feeding of the five thousand. Jesus managed to feed all five thousand people from only the food the boy had shared. After Jesus died Andrew preached Christianity throughout Poland, Russia and Greece. It was in Greece that Andrew was crucified on an X shaped cross as he thought himself unworthy of dying on a vertical cross like Jesus. Time passed, a monk called Regulus, or Rule, was watching over St. Andrew’s bones. The story goes that an angel appeared to Rule and told him to take the relics to the far west. The journey was long and arduous. Rule was shipwrecked on the east coast of Scotland, in a place where the town of St. Andrews now stands. 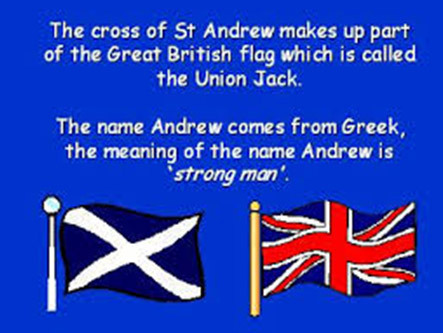 Over the centuries St. Andrew became important to the Scottish people. This is why the X shape of his cross, or saltire, is part of the Scottish Flag. 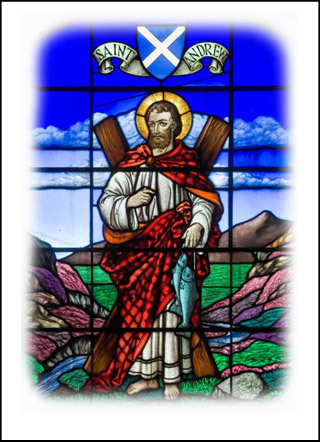 St. Andrew became the patron saint of Scotland about a thousand years ago, and St. Andrew’s day continues to be celebrated on the 30th of November each year.